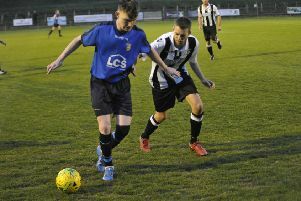 There was a sense of deja vu for Bexhill United Football Club after a narrow away defeat on Saturday. The Pirates were beaten 2-1 by in-form Mile Oak in Macron Store Southern Combination Football League Division One - an identical outcome to their last trip to north-west Brighton for a league cup tie in October. Not only was the result the same, but the game followed a similar pattern, with Bexhill manager Marc Munday feeling his team deserved better on both occasions. Munday felt his team dominated much of the final 80 minutes against a fifth-placed Mile Oak side which has won its last seven matches. The Bexhill boss was pleased with how his team coped with playing into the wind during the first half. The visitors fashioned a couple of opportunities from corners and from one of them, Munday’s header across goal only needed a touch from either of the two Bexhill players near the Mile Oak goal. Bexhill were enjoying a decent spell when Mile Oak drew first blood with a wonder strike in the 40th minute. Michael Gould cut in slightly from the left and unleashed a 25-yard piledriver into the top corner. Munday felt it was all-Bexhill early in the second period, but Oak doubled their advantage at a time when Craig Ottley was struggling with an injury. Jack Arnold popped up unmarked at the back post to score with a good header. The goal seemed to be the catalyst for Bexhill to get a few more shots away and Wes Peoples pulled one back with virtually his first touch after coming off the bench, becoming Bexhill’s 18th different scorer this season in the process. Bexhill pushed for an equaliser, but it wasn’t to be. Vitor Pestana, who came to life in the second half, had a shot touched onto the crossbar, while Allan McMinigal saw an effort blocked on the goal-line and a goalmouth scramble came to nothing. With goalkeeper Elliot Stokes away, Adam Osborne performed very well on his debut between the posts. Peoples looked sharp when he came on and fellow sub Mark Blanche also did well. Bexhill: Osborne; A. Cooper, Munday, Cruikshank, Ottley (Blanche); A. Tudor, Elliott-Noye, McMinigal, Pestana; Wheeler (Peoples), Barden.